Plaques of Dublin: A.W.W Baker (Defence of Trinity College Dublin,1916) | Come Here To Me! « I’ll avoid the ‘Great Friday’ pun…. I’m far from finished exploring the street level plaques of Dublin, but recently it was suggested to me to move my search indoors. Hospitals, schools, churches and more besides all boast great historic plaques in this city, and some are real hidden gems. Church of Ireland churches can throw up interesting stuff in particular, for example often containing significant overlooked WWI memorials. St. Ann’s Church on Dawson Street contains the above plaque, to a man who took part in the defence of Trinity College Dublin during the 1916 Rising. To the prompt measures, defensive and offensive, organised by the Corps was due the preservation of valuable life and property in Grafton Street, Nassau Street, College Green, College Street, Dame Street and Westmoreland Street, including not only the historic buildings of the College itself, but the Bank of Ireland and many other of our finest buldings. Interestingly, members of the OTC were joined by Canadian and Australian soldiers in the defence of the college. W.J Brennan-Whitmore wrote at length in his memoir of the rebellion of exchanging fire with a sniper at Trinity College Dublin, later meeting an Australian Sergeant and asking “Are you the so-and-so that was sniping at us out of the corner of Trinity College?” Indeed, the man was! Appreciation for the efforts of the OTC materialised in a fund, exceeding £700, gathered via contributions from ratepayers in the area and citizens. 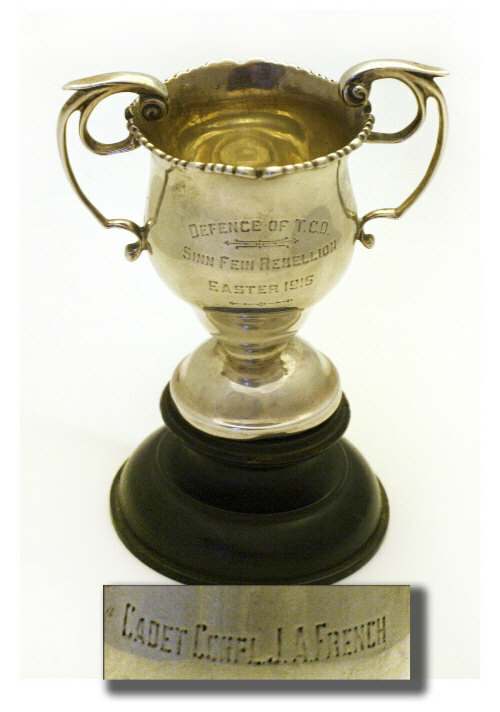 Each member of the Corps was presented with small beautiful silver cup which marked their participation in the week, with the engraved inscription: ‘DEFENSE OF T.C.D – SINN FÉIN REBELLION – EASTER 1916’. One of these cups, pictured below, sold for €3000 at Adam’s last year. Image from Adams Auctioneers. This cup was sold in 2011 for €3000. Great biographical detail on A.W.W Baker has been added to findagrave.com by Debra L.Rooke, detailing not his family background but also his profession and life following Easter Week. A Dubliner, Baker was married to Anna Margaret Constance Stubbs, with whom he had five children, two of whom survived beyond the age of 5. He specialised in the area of dentistry, and Rookes biographical information notes that he was awarded his Masters in Dental Science in 1904. 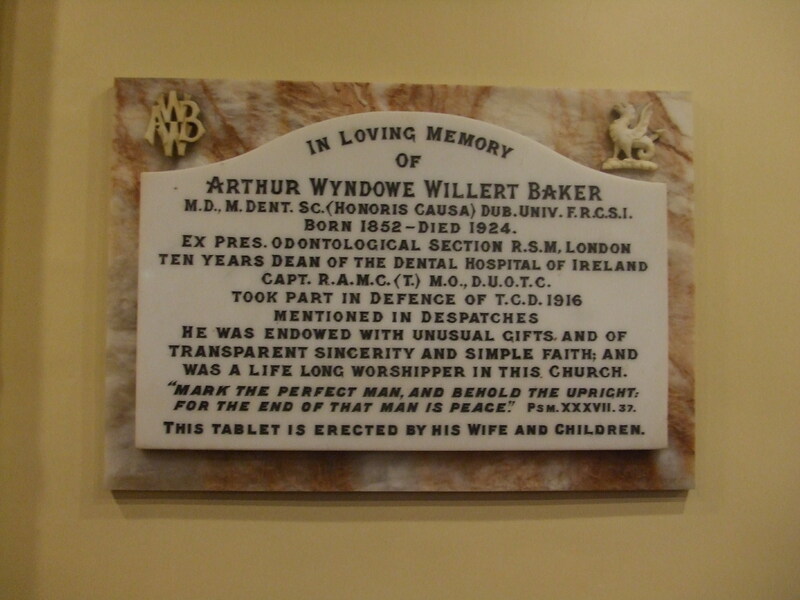 A. W. W. Baker died 5 July 1924, succumbing to gangrene at the age of 71. He is buried in Mount Jerome Cemetery, Dublin, Ireland with his wife and children. Many of his works may be found by searching under A. W. W. Baker in Google Books. 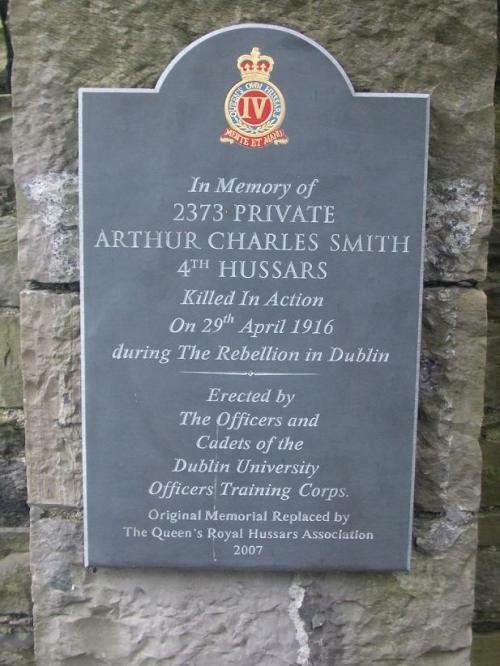 Inside the grounds of Trinity College, one finds a plaque to commemorate Arthur Charles Smith of the 4th Hussars who was buried on campus at the time of the insurrection, but is today buried in Grangegorman Cemetery. In the dim and distant past I used to work as a tour guide which started from Trinity College. Always got quite a few Aussie tourists who were eager in join any harmless Brit-bashing that the tour might involve…until I mentioned the ANZACs and Trinity in 1916. Red faces all around. The Canadians were never as bothered as far as I remember. Some ANZACs and Canadians in the Black and Tans and Auxies too, if I’m not mistaken. Here is a new plaque in Sean McDermot street just unveiled today. Hi Hugh I wonder could you contact me re your research? an American who took part in the Easter Rising as a member of the British Army was Clive Wilson Warman. Killed in 1919 in an air crash in London having moved on to the Royal Air Force. I was recently at a family reunion in Drumheller Alberta. It was for the descendants of G.A. Howell. Among some mementos there were two of the small silver cups shown above. One to my Grandfather, George. A. Howell, and the other to his son (my “Uncle Mick”) Ruben H. Howell. Ruben was killed in France in 1918. I was fascinated to read these reports with outtakes of stories I have been familiar with all my life, and to see the cups that are the same as the ones given to my family members. The small silver cup awarded to one of the 5 New Zealanders present, Corporal Alexander Don NZFA is currently on display at The Otago Regional Museum in Dunedin, New Zealand. Don later became a school master and died in Wellington in 1954, aged 57.